Jane Musgrove is my 1st cousin 2x removed. Her parents are George Musgrove and Elizabeth Ann Stoup. Our common ancestors are Harrison Musgrove and Jane Rooking – my 2x great grandparents. Jane was born in Westmorland on 18 September 1884. She was the first of five children. The family gradually moved south from Westmorland eventually settling in Clitheroe, Lancashire. On 12 February 1908 Jane married Walter Fletcher. They were married for 41 years and had three daughters. 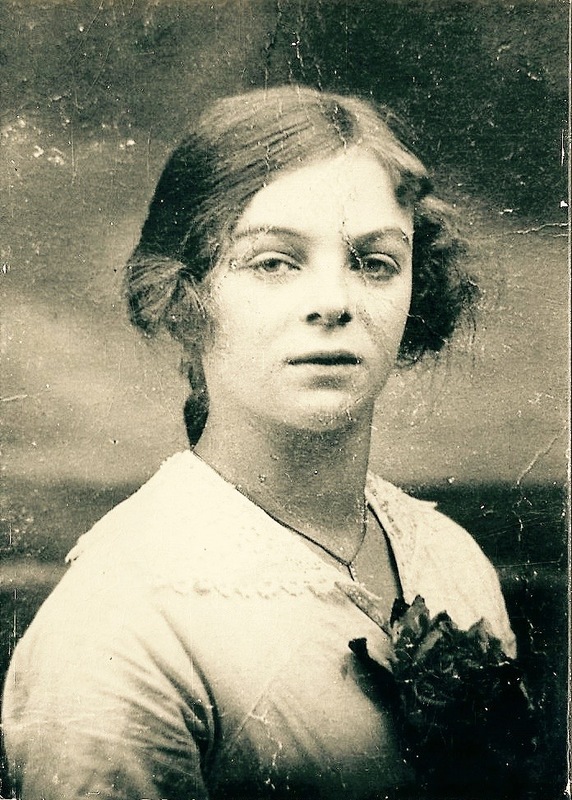 Jane passed away on 25 March 1949. 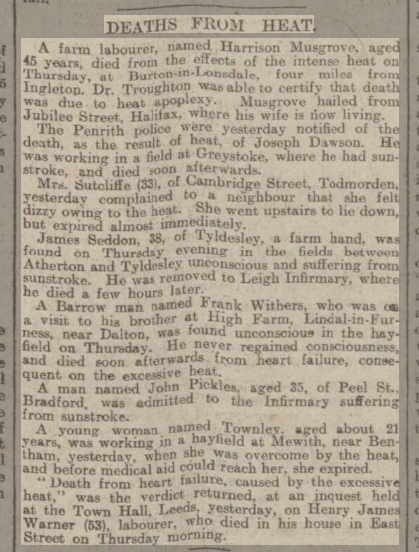 The Clitheroe Advertiser and Times reported her death on 1 April 1949 (image from http://www.britishnewspaperarchive.co.uk). The death occurred at her home on Friday of Mrs Jane Fletcher, of 7 Chester Avenue, Clitheroe, at the age of 64. Mrs Fletcher, who was born at Leighton Beck, Westmorland, came to Clitheroe 50 years ago. She was keenly interested in the Clitheroe Women’s Unionist Association of which she was a member for many years. Her husband, Mr Walter Fletcher, and her three daughters and three sisters, will have much sympathy in their loss. The interment took place at St. Mary’s Cemetery on Tuesday, after a service at the house. The Vicar of Low Moor, the Rev. I Pugh, officiated. Lewis Coles is my 3rd cousin. He was born sometime in the fourth quarter of 1938 – his birth was registered at Darwen in Lancashire. Lewis is the second child of Lewis Charles Coles and Irene Fletcher. Our common ancestors are Harrison Musgrove and Jane Rooking – my 2x great grandparents. In the 1939 Register Lewis’s parents are living at 9 Hollies Road, Blackburn, Lancashire. His father’s occupation is “schoolmaster”. I know from the newspaper article below that Lewis attended Clitheroe Royal Grammar School, where his father was an English master. It seems that Lewis was a bit of a star at athletics and was awarded the Victor Ludorum Cup in 1955. This is an extract from the Clitheroe Advertiser and Times of Friday 15 July 1955. – taken from the British Newspaper Archives website. Sixteen-year-old Lewis Coles, of Hollies Road, Wilpshire, son of Mr L C Coles, English master at Clitheroe Royal Grammar School, became this year’s Victor Ludorum at the school’s annual sports at High Moor, on Tuesday. Coles, who had 11 points, was presented with the Victor Ludorum Cup by a former physical training master at the school, Mr D W Spencer. He had earlier set up two new school records running 100 yards in 10.6 seconds, and 220 yards in 24.6 seconds. The following year Lewis was runner up to Colin David Ford – only one point separated them. If I say so myself I was also pretty nippy as a runner at school and won both the 100 and 220 yards races for my “house”. I also represented the school at West Leeds Schools athletic events. Now I’m lucky if I can manage to run a bath!! Joseph Musgrove is my great grandfather. He was born on 1 December 1866 in Kendal, Westmorland, to parents Harrison Musgrove and Jane Rooking. Joseph was the youngest of eight children. He was baptised on 21 April 1867 in Kendal. Less than a year later his father (Harrison) died on 16 April 1868. Then when Joseph was six years old his mother (Jane) died on 12 April 1873. I guess that Joseph would have been looked after by his older siblings after the death of their parents. And in the 1881 census he is boarding with his eldest sister Agnes and her husband David Hutchinson at Albert Hill in Settle, West Yorkshire. By the time of the next census on 5 April 1891 Joseph was back in Westmorland working as an agricultural labourer and living on a farm in Duke Street, Holme – about 10 miles south of Kendal. Just over two years later Joseph married Elizabeth Ann Turner on 12 April 1893 at Settle Register Office. Not sure what it is about the month of April but all the previous significant events happened in that month!!! Anyway, Joseph and Elizabeth journeyed south to Clitheroe in Lancashire – stopping off on their way for three or four years at Horton in Ribblesdale, West Yorkshire, where Joseph worked in the limestone quarry. Their first three children were born and baptised here. At this time the family lived at Foredale Cottages – in the photograph below you can see the cottages on the hillside below the quarry. In the 1901 and 1911 census returns Joseph is still working as a limestone quarryman – now at the local Clitheroe quarry. Sadly Joseph developed stomach cancer and he died at home on 30 September 1933. He was buried at Clitheroe Cemetery on 4 October 1933. The archives for the Clitheroe Advertiser & Times have recently been added to the British Newspaper Archives website. I just discovered the following obituary. A further death we have to record is that of Mr Joseph Musgrove, of 28 Russell Street. Mr Musgrove, who was sixty-six years of age, died on Sunday after a brief illness. Since the war Mr Musgrove had carried on business as a general dealer and was particularly well known among the farming community, his business bringing him into contact with farmers at the Clitheroe Auction Mart. A native of Kendal he had lived in Clitheroe for forty years, and for more than twenty years resided in Salford. At one period he was employed as a quarryman at Bold Venture Quarries. He leaves a widow, three sons and five daughters. The interment took place at St Mary’s Cemetery on Wednesday, the Rev S E Harper officiating. Eleanor Musgrove is my 2nd great grand aunt. She is the daughter of my 3x great grandparents William Musgrove and Harriot Francis. Eleanor was born in 1838 and baptised on 2 July that year in Kendal, Westmorland. She married Edward Hopkinson in 1855. From what I have been able to establish so far from newspaper archives Eleanor was often up to “no good”. My blog post HERE reports her being sent to the House of Correction for three months in February 1861 for stealing. The article below from the Westmorland Gazette of 7 October 1865 suggests that a spell in “chokey” didn’t teach Eleanor any lessons. Eleanor Hopkinson, alias “Nell Muss”, George Carradice, Mary Barber, and Harrison Musgrove, were charged with stealing five five-pound notes, the property of John Moon, a swiller. Mr C G Thompson appeared for the prosecutor, and Mr C T Clark, (Lancaster), for the defence. The case occupied a considerable time, so that we can only give the main facts. The prosecutor, according to his own account, late on Saturday night went down the yard, at the bottom of which the prisoners lodge, and there met with the woman Hopkinson, who lives with the prisoner Carradice. Next morning he missed the notes and gave information of the numbers to the bank, and also informed the police. From further evidence it appeared that on Sunday evening the prisoner Hopkinson tried to change one of the notes at the Black Bull Inn, and that upon searching the prisoners’ lodgings Mr Hibberd found another of the notes (also identified by the prosecutor) concealed (and also a watch) in some ashes. Hopkinson and Carradice were committed for trial, but there not appearing to be sufficient evidence against Barber and Musgrove, they were discharged. Eleanor Hopkinson and George Carradice were then charged with stealing a watch, the property of Leonard Medcalf, a driver. The watch was found by Mr Hibbered while searching for the bank notes, wrapped up together with a note, in a piece of calico, under some ashes and other rubbish. The prosecutor had lost the watch while on the road between Kendal and Holme, and it was no doubt stolen when he was asleep. Carradice was committed for trial on the charge, and the woman was discharged. Next Sunday remember to come back for the result of the trial of Eleanor and George!! Regular readers of my blog will know that Harrison Musgrove (brother of Eleanor) mentioned in the first case in the article is also one of my ancestors – it makes a nice change to see him not charged with an offence this time!! You can read more about him in the Black Sheep Sunday category of my blog. Carradice is also one of my ancestral names from this time in Kendal. However I do not have a George Carradice in my family tree at the moment, but I suppose there is still time for me to identify yet another felon in my history!! I checked the 1871 census and found George Carradice and Eleanor Carradice living in Kirkland Capper Lane, Kendal. Harrison Musgrove is my great grand uncle. His parents are Harrison Musgrove and Jane Rooking (my 2x great grandparents). Harrison was born on 29 May 1858 in Kendal, Westmorland. He remained in Kendal until sometime in the mid 1880’s. On the 1871 census at the age of 12 his occupation is given as “tobacconist” and in 1881 he was working as a “farm servant indoors”. In the 1891 census the family were living near Horton in Ribblesdale and Harrison was working as a “general labourer”. By 1901 they had moved to Holme, Lancashire and Harrison was now a “limestone quarryman”. The family continued their regular travels and in 1911 they were living in Halifax, West Yorkshire. Harrison was employed as a “quarryman”. I have today found the following article from the Yorkshire Post & Leeds Intelligencer of 15 July 1911. A farm labourer, named Harrison Musgrove, aged 45 years, died from the effects of the intense heat on Thursday, at Burton-in-Lonsdale, four miles from Ingleton. Dr Troughton was able to certify that death was due to heat apoplexy. Musgrove hailed from Jubilee Street, Halifax, where his wife is now living. Harrison left a will with effects of £5 going to his wife Jane. The final post in this series about my 2x great grandfather is from the Kendal Mercury of Saturday 29 October 1864. Here he is charged with several other men with loitering. John Bousfield, William Barnes, James Fisher, Thomas Jameson, John Thompson, Harrison Musgrove and James Rigg, all of Kendal, were summoned by the police for loitering in Highgate, at the bottom of All Hallows’ Lane, on Monday the 17th instant. They were dismissed with a caution, the Mayor remarking that he hoped they would not render themselves liable to be brought up again for a similar offence, as the Council was determined to put the bye-laws in force in this matter. On Saturday 1 August 1863 Harrison and his brother George were mentioned in the Kendal Mercury as part of a report of the Kendal Magistrates meeting. It seems that the brothers had gone away to Carlisle leaving their wives and families to seek help from the Kendal Union. According to the newspaper article this wasn’t the first time either. Before J J Wilson and Wm. Longmire, Esqrs. Harrison Musgrove and G Musgrove, two sawyers, were apprehended at Carlisle on a charge of leaving their wives and families chargeable to the Kendal Union. As they had been committed before on a similar charge they were sent for two months to the House of Correction with hard labour.